Okay. If you are planning to rent this film because you like Will Ferrell, or because you laughed (as I did) at his intellectual masterpiece Land of the Lost… stop and think for a minute, a practice this film ignored completely. Emotionally underdeveloped males are not funny. Vindictive man-child squabbling is not funny. Middle aged men too lazy and pathetic to get off of their behinds and get jobs, only feed off of their long-suffering parents with the will and determination of parasites… not funny. Even if one of them is played by Will Ferrell, the humor is still pretty nonexistent. Step Brothers, an uneasy blend of Paul Blart – Mall Cop and Chuck & Buck, is the kind of throwaway film people might awkwardly refer to as “cute” (as in “was it a good movie? it was… cute.”) The trouble is, it is far too resolute in it’s crudity to pass as such. It mistakes winces for laughs and hammers its content ferociously into the viewer’s face, hoping that its gall will earn some kind of respect. It’s not even or satirical enough to pass as dark humor. As a feel-good raunchy comedy, it misses its mark completely, despite some ‘ah gee’ moments near the end where relationships are salvaged and the imbeciles are rewarded for their actions. The premise runs like this – two older people Robert (Richard Jenkins) and Nancy (Mary Steenburgen) meet at a science convention, bond, and are in each other’s pants within the next five minutes. They put their clothes on, straighten up and get married. Nancy and Robert would like nothing more than to take Robert’s boat and embark on an indefinite vacation. 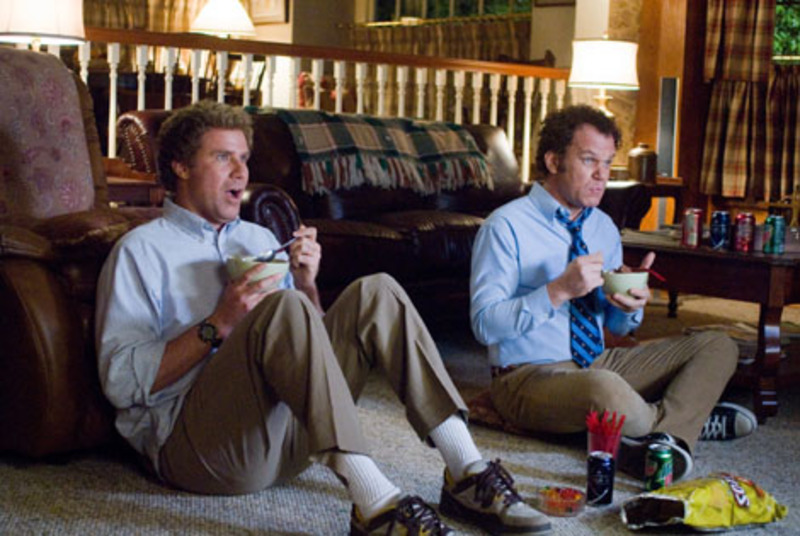 The trouble arises with their two sons, Brennan (Ferrell) and Dale (Reilly), middle-aged slackers who live at home and don’t take well to the courtship.The two of them spend the film masturbating, eating junk food, being beaten by children, beating children, and flaunting foul language like a college degree. Their idiocy is almost redeemed by the introduction of Brennan’s successful brother, Derek, who is more deplorable than they are. But it’s tough competition. One both rubs his testicles on a drum set and is forced to lick a mound of dog feces, all in the same film. If you are interested in seeing Will Ferrell’s balls, maybe you should rent and enjoy this movie. If not…. maybe not. They should probably be marked as Will Ferrell = Brennan and John C. Reilly = Dale, since there is no personal variation between them. They exist as characters to disgust and half-heartedly amuse.